The last time I posted a blog you had all waited for 5 months, and now I am back after only 2 weeks. Well much has happened and I am delighted to be telling you about a lovely new actress who has joined us for the next school year. 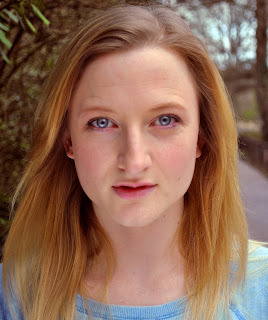 Amanda Madison is currently starring at the Cambridge Shakespeare Festival in "Titus Andronicus" and "As You Like It". rehearsals and line learning with ATTC. When you have read this just turn to our "Actors" page to find out more about Amanda. Now for a touch of sadness. The delightful young Emily Windham is leaving us to go to The Royal Central School of Speech and Drama. We are delighted that she has won a place at this long established and most prestigous academy. We know she will do well, so just watch out for her when she lights up the London stages in two or three years time. In case you have forgotten what she looks like, she is the one with the dazzling red hair. Just look at an earlier blog and she will be there. As if all these changes were not enough, we are ploughing on with the creation of more Drama Workshops to meet the growing demand from schools. We can now say with confidence "give us a subject and we will have a Drama Workshop ready to fit the bill". Moreover, we are taking many enquiries from senior schools following the curriculum changes, and we are enjoying the engagement with older students. Before I sign off, take a look at our new young lady I have told you about.